I'm hoping to do some posts that are "magazine inspired". have come from the pages of great layouts. Spooky vignette to really get you in the mood. Great for an entry if you're having a get-together. 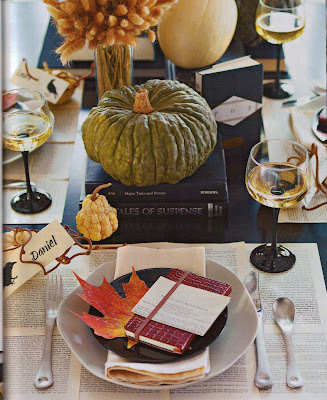 Wonderful tablescape consisting of black books and pumpkins. Casual dishes, bookpage print placemats, and colorfull fall leaves. to make your table decor a real party! I agree the Poe inspired settings are awesome. The chalkboard really drives the theme home. I am becoming a fan of chalkboards. So versatile! I love this! These vignettes are too cute for the holidays! Such great ideas!!! Thank you for sharing because I don't get that magazine. This post just makes me want to climb in the attic and take all my fall decorations down and totally deck the house. But, I think I will pass this year and resume holiday festivities next year (hopefully). Until then, I'll just keep enjoying these beautiful posts of yours!!!! Lovely blog -- I'm glad you stopped by so I could find you. I am a complete magazine JUNKIE. Have way too many, but I keep looking at them anyway. I went into mourning when Country Home and Southern Accents folded! 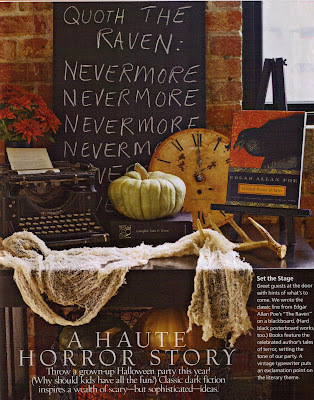 Lovely vignettes, and I do like that header -- I think I'm going to have to go invest in some pumpkins and steal Martha's ideas for That Old House! Loved your heirloom post, too -- wonderful old sideboard, made even more beautiful by the memories it holds. I love this post Debra! So many great ideas Im gonna use! Thanks! I'm so excited!! 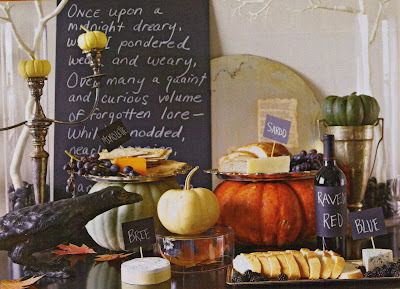 !i think the photos with the platters on the pumpkins is so cool! I love the first one the best since I'm crazy for Poe poetry and stories. They are all too cool. I the idea of using Poe's The Raven as inspiration. I am a magazine junky as well. So many awesome ideas. Thanks for sharing. I am feeling a little inspirationaless (is that even a word??) right now, but these pictures have certainly given me some "food" for thought! I love looking at magazine too. I'm not big on Halloween stuff but gotter getter going for this next month, so thanks for your post! Wow, wow!! I love that fall entry that you have up for your title header! Great ideas. I've been seeing a lot of neat halloween ideas in the magazines this year. They all seem to have a very classy feeling to them this time around. First, I want your header to be my front porch! Wouldn't that be wonderful to come home to and to have guests enter. Second, thanks for the visit to my blog...I immediately went at looked at each doorstop for a mark, but alas...none! I am not rich, just a collector of door colorful doorstops. Thanks for the advice. These are great images and great inspiration. Thanks for sharing them. Tablescapes and vignettes are such a great way to decorate for the holidays and after seeing these I am inspired to start setting the stage for fall and Halloween. Great post! I also look to magazines all the time for inspiration!